The Geauga Amish Historical Library recently opened in the heart of America’s fourth-largest Amish settlement, in the town of Middlefield, Ohio. John Gingerich is the only non-Amish member of the five-person board, which by default also makes him the library’s internet liaison. You might remember seeing John on this site a few years ago discussing his translation of History of the Bernese Anabaptists. John, who is of Amish background, played a key role in helping the library come about, and also helped furnish items for the collection. I asked him to answer a few questions today about this new institution, and on the Amish of Geauga County. 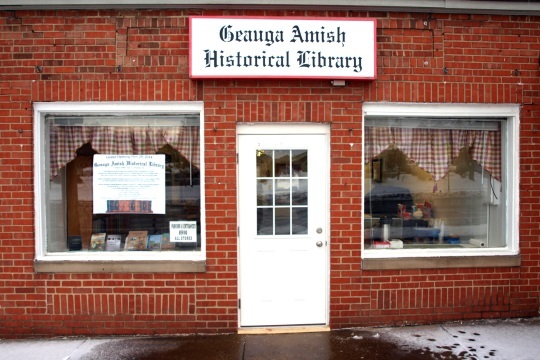 How did the Geauga Amish Historical Library get its start? John Gingerich: We first began discussing the formation of a local Amish history library in 2008, when the bi-annual national Amish historical meeting was hosted in Geauga County. I was invited to be part of the committee that organized the event, since I come from Amish background, have been long interested in Amish history and have been collecting books and other items significant to Amish-Mennonite-Anabaptist history for a while. Although everyone on the committee agreed that we should have our own local Amish history library, especially since this area is recognized as the fourth largest Amish settlement in America, there wasn’t much follow-up momentum after the history meeting. However, we would meet occasionally and discuss the idea until finally, early in 2014, we decided that this was going to be the year we would make a serious effort to form a library. The family of the late Mennonite minister, historian and author Steve Estes in Illinois heard about what we were trying to do, and generously donated his library of reference books, periodicals, as well as his original research files. Between my collection of old books and reference materials, and books, documents and artifacts belonging to the other Amish people involved, we believed we had the materials to make an interesting library. Now it was a matter of finding the right location. We wanted a good central location with easy access for the Amish to visit. In September, a small store in downtown Middlefield came up for rent, and we had some discussions with the landlord. He liked what we were trying to do and worked out a fair price for the rental. 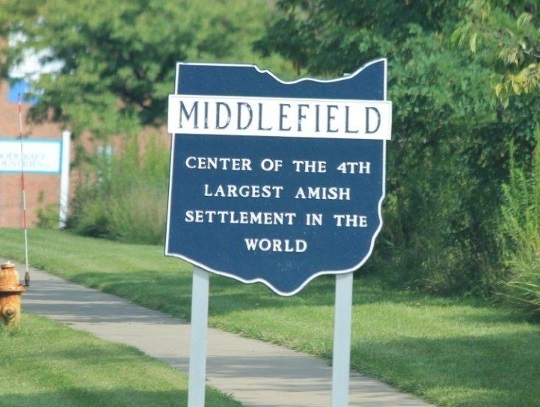 The location was ideal, for it was right in the heart of the local Amish settlement. Many of the Amish come to Middlefield to do their shopping. We agreed to rent the facility, and we immediately began receiving some financial donations to help fund the library for at least the first few months. We also were donated several beautiful oak display cases, some bookshelves and other items we would need for our library. After working many evenings and Saturdays over a six-week time period, we finally had our grand opening this past November 29th, which was well attended, and we received many favorable comments. How are Amish involved in this project? John Gingerich: Currently we have a five-member library board, of which I am the only non-Amish member. However, quite a number of other Amish people have been involved in helping us financially, along with donations of items of local historical interest, and with volunteer labor. The library is governed by the Amish, and will only prosper with the support of the Amish. Our bylaws dictate that a majority of the board members must be members of the Amish Church. This is to ensure that control of the library will remain in the hands of the Amish. John Gingerich: Since Amish-Mennonite-Anabaptist history has been of long-time interest to me, I’m very hopeful that this will be a permanent home for my collection of Bibles, prayerbooks, hymnals and other items, some dating back to the 1500’s. I’m honored that I’ve been welcomed by the Amish, and invited to be a part of this project. By default, I’ve become the head librarian/archivist, and have been cataloguing the library’s holdings, as well as setting up the displays. What are the goals of this institution? John Gingerich: One of the goals of the library is to not only collect items of interest to Amish and Anabaptist history, especially those relating to the local settlement, but to also work with the local Amish community in providing information about Amish history and genealogy. We hope some of the local Amish schools will visit the library on field trips, and that we can develop programs appropriate for these visits. In addition, we plan on helping the local Amish, and those of Amish descent, learn about their family history using the genealogy information in the library, as well as through other resources we have available. Finally, we’d like to collect, copy, translate and collate old letters, diaries, ledgers, inscriptions contained in books, etc, and then cross-reference this material in order to gain a broader perspective into the lives and families of the early Amish settlers in this area. We hope to make this information available in our newsletter as we gather it, and possibly to produce a book containing this information. It’s our hope that, long after we’re gone, this information will be preserved for future generations. What are some of the interesting things you have in the library? What is your oldest possession? John Gingerich: We have some really interesting items on display. For example, we have a chair made by “Der Weiss” Jonas Stutzman, the first settler in Walnut Creek, OH, who later in life wore only white clothing. There are many stories about him, and he is the ancestor of many of the local Amish (including me). We have a coat that belonged to Jeremiah D Troyer (1853-1921), an early settler in Geauga County. We also have on display two ledgers that belonged to Samuel W Weaver, the first Amish settler in Geauga County. Also on display are several other ledgers belonging to early Geauga County settlers, such as John K Fisher (1854-1930). The oldest book currently on display is a 1580 Froschauer Bible. Of particular interest are seven “Anabaptist” Testaments ranging from 1687-1825. These have such an interesting history, since they were banned in Switzerland, and being discovered with one could subject a person to confiscation, imprisonment, exile, being sold as a galley slave, or worse. We’re going to have rotating thematic displays, changing every few months. A future display will feature a number of European editions of the Amish hymnal the Ausbund, as well as all the American printings from 1742-1922. We also have several “Sammelbands” (books custom bound by the Anabaptists containing various hymns, pamphlets, booklets, and books). One of these contains a printing of the Schleitheim Confession of 1527, probably printed in the mid-to-late 1600’s, as well as some hymns that were originally distributed in pamphlet form. We also have a 1744 Anabaptist reprinting of the 1536 Froschauer Bible, owned by a Swiss Anabaptist living in France, whose great-grandson married the first Amish child born in Ohio. We have permanent shelves of reference books, genealogies, directories from many communities, items relating to demographics, health and education, as well as almost every issue of the local “Gemeindebrief” (the local church newsletter), as well as “Pennsylvania Mennonite Heritage,” “Mennonite Family History,” many issues of “Mennonite Quarterly Review,” “Illinois Mennonite Heritage,” and others. 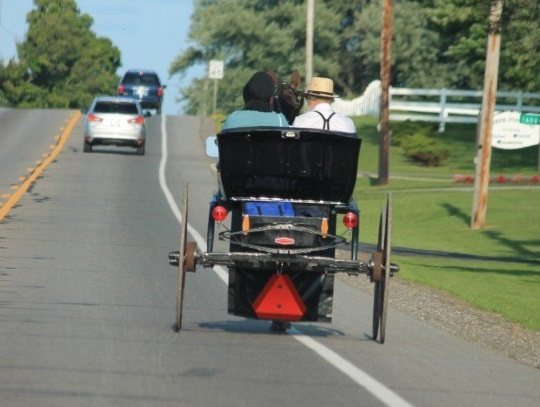 What’s something interesting about Geauga County Amish history that we might not know? John Gingerich: When the Amish first came to Geauga County, many were not in a strong financial position. One story often related is that Geauga County would have been a good poorhouse, if it only had a roof! 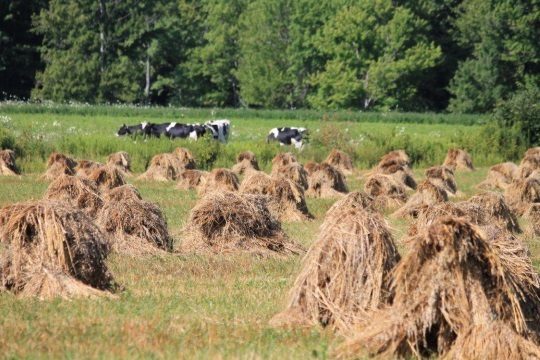 Most of the early Amish settlers did not own land, but worked the farms as 50/50 sharecroppers. Even as many settlers moved in from Holmes County and other areas, many families moved out. Despite outward migrations, many more families moved in and the settlement grew slowly until the latter half of the 20th century, when it began to grow very quickly. Currently, there are 111 church districts comprising approximately 15,000 persons in 4 counties. Most of the local Amish no longer depend on farming for a living, although many still do some farming. Many work in the construction trades, some work in factories, and many have their own businesses. Geauga County is a large maple syrup producing area, and many Amish have their own sugar bushes, with some producing over 2,000 gallons of syrup in a typical sugaring season. How are you financed, and how do we find you? John Gingerich: We have obtained IRS approval as a 501 (c) (3) nonprofit organization. Thus, qualified donations can be tax deductible (not so subtle hint, if anyone wishes to make a donation). We’re operating on a very thin “shoestring” budget right now, so donations would be most welcome! We’re not really set up as a tourist location, but anyone is welcome to visit. We’re also not a lending library, and are currently open only on Saturdays from 9 a.m. – 2 p.m., or by appointment. The library is located at 15960 E High St, Middlefield, OH, in Geauga County. The mailing address is c/o Samuel J Weaver, 17117 Newcomb Rd, Middlefield, OH 44062. For more information, I can be contacted at GAHL@windstream.net. This is fascinating stuff to me. I like Historical Libraries, Archives, Historical Societies and even Friends groups. That said, I am a volunteer at a museum and as a consequence a member of their Friends Of group, I have also maintained membership in a local, sort of affiliated Historical Society which runs a separate Library / Archive. The HS and the Friends made a bit of a split within the last couple of years, the municipality has a small conference space within the property of the museum park, and both groups had held collective meetings at the same time, fantastic arrangement for me, but the HS group chose to use a different space in the community while the Friends society kept up use of the Museum space, now both groups meet on different nights of the month, not great with me for work scheduling and traveling. The Friends meetings have typically conflicted with my work, and the HS meetings typically talk about places and locales that are not local. There are probably a great core group of people who volunteer their time beyond the management board, that Mr Gingerich is a member, I’d like to applaud those people, kudos to all the people people involved in the Middlefield project! I am making note of the address as some of my relatives live in the town next to Middlefield and, though I don’t know when it will be, my next trip to see them I want to visit this library. Thanks for this intersting article. What a wonderful endeavor, building this library and providing it with many of your historical possessions..
Im afraid it might feel something like giving up my first born if I were to give up some of my special books.. even if I knew they’d be loved by many and it was the right thing to do. My hat is off to you John G.
I’d love to stop by sometime & look at some of the genealogy you have.. Next time I get back on a kick, I’ll be in touch. You’re right KimH, it might sound strange to some, but many of my books have become like good friends over the years; however, I’m hopeful they’ll have found a good home for many years to come!